You don’t need to deep fry to make terrific fish tacos. You just need a really great marinade! 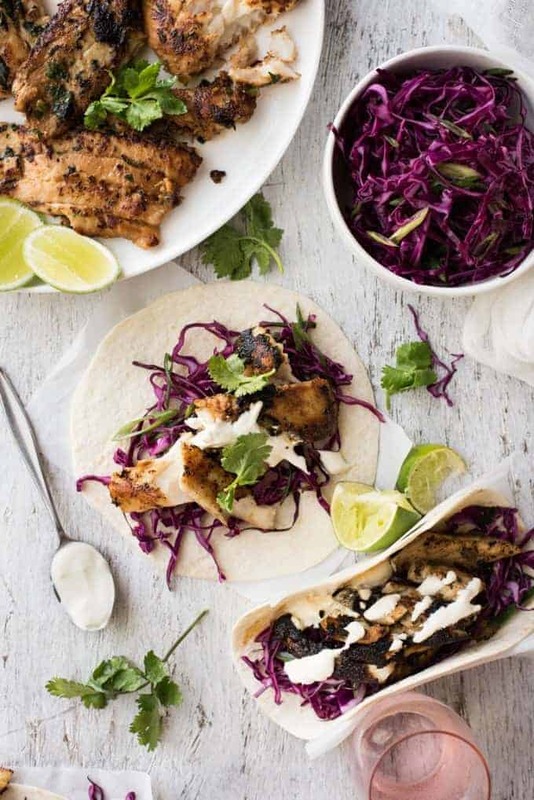 The Pickled Red Cabbage Slaw for the tacos is a simple, perfect accompaniment with the flaky, flavour infused fish packed inside warm tortillas! Confession: I had my first fish taco ever 3 years ago and I didn’t enjoy it. There are lots of bad fish tacos “out there” and a bad fish taco is worse than a bad chicken taco. While most people would be turned off a bad food experience, I persevered, believing there to be better. I mean, tacos. They have always been one of my favourite foods, ever since the first time I tried them. And I’m thankful I didn’t give up. Because it just got better and better. Went to Mexico, tasted the real deal, came back and tweaked my recipe. And now I’ve got The Fish Taco recipe. Well, at least, what I think is the BEST Fish Taco recipe. As for grilled fish tacos, I truly believe that the best way to make them is to marinate them. Getting that flavour infused right into the flesh of the fish really goes a long way to making the ordinary extraordinary. Promise! 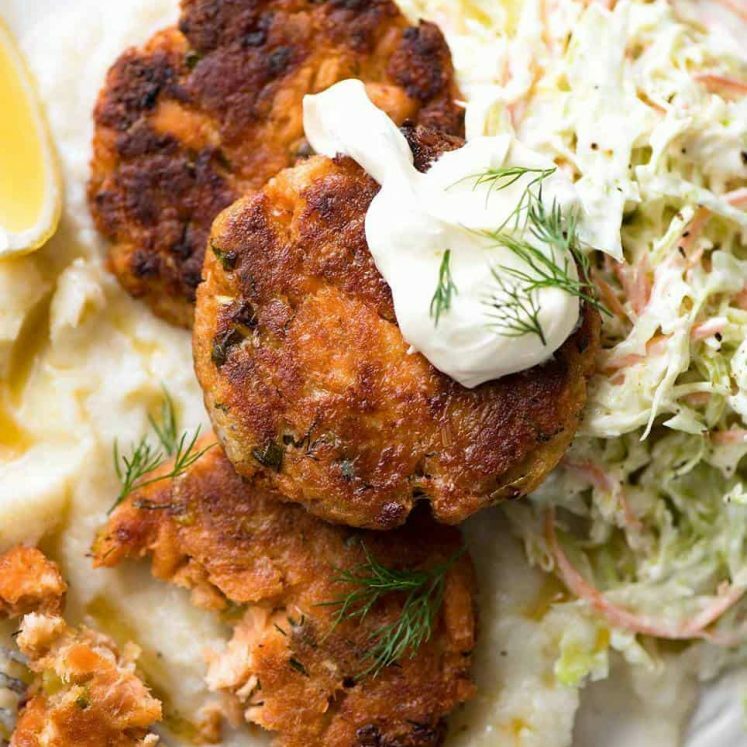 Fish doesn’t require long to marinade – just 20 minutes. 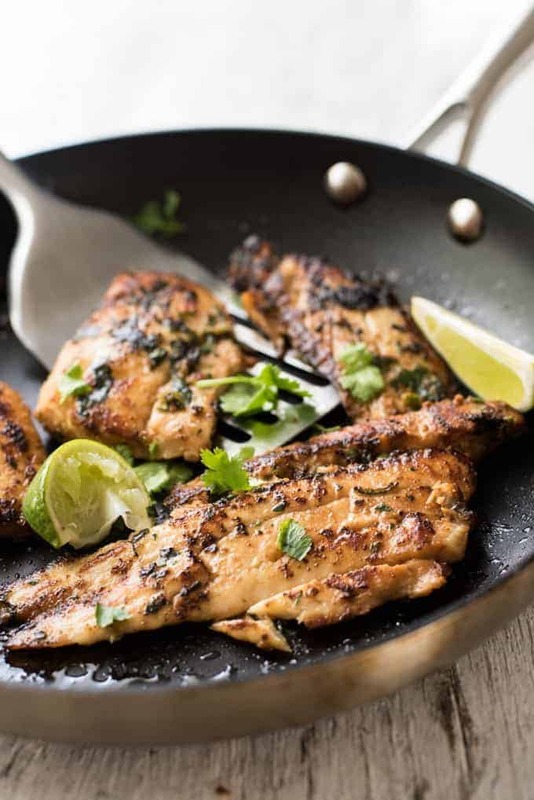 And because the marinade has lime juice in it, you actually don’t want to marinate it for too long otherwise the fish ends up cooking, like ceviche! A quick grill or sear in a skillet, and look! Beautiful flavour infused fish fillets to stuff into tacos. 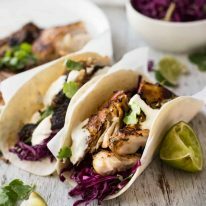 And while the fish is the star of these tacos, this recipe wouldn’t be complete without a mention of the cabbage slaw, a lightly pickled cabbage. I am often asked what sides I recommend for tacos and this is one that I don’t make often but I don’t know why. It adds crunch and colour and a touch of tang which is a perfect accompaniment for any type of tacos, from fresh grilled fish like this, or to cut through the richness of Shredded Beef Tacos. I typically cook this in a skillet for midweek meals but this is fantastic for grilling outdoors when you have friends over. It cooks so quickly so it doesn’t take you away from your guests and you can throw the tortillas onto the BBQ to warm up. 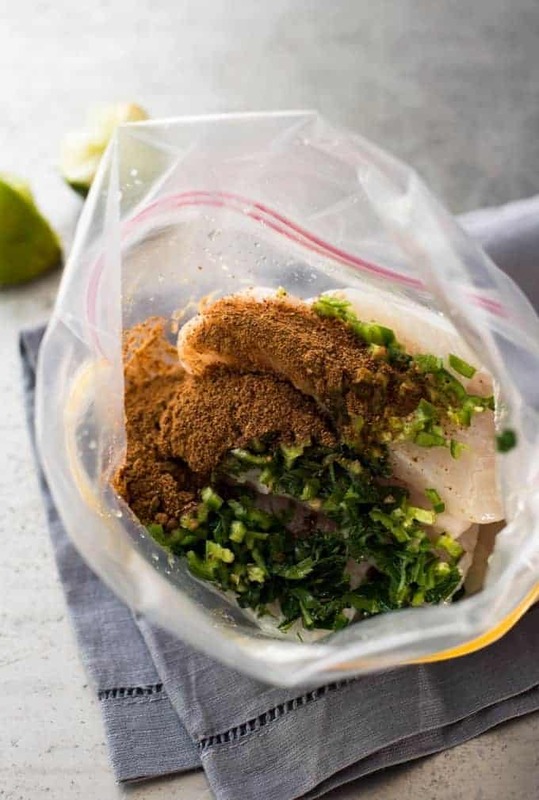 Combine Fish Marinade ingredients in a ziplock bag. Set aside for 20 minutes to marinate - no longer than 1 hour. Place Pickled Cabbage ingredients in a bowl. Toss to combine and set aside for 30 minutes. Drain excess liquid, scrunch cabbage with your hands (to help soften). Heat oil in a skillet over high heat. 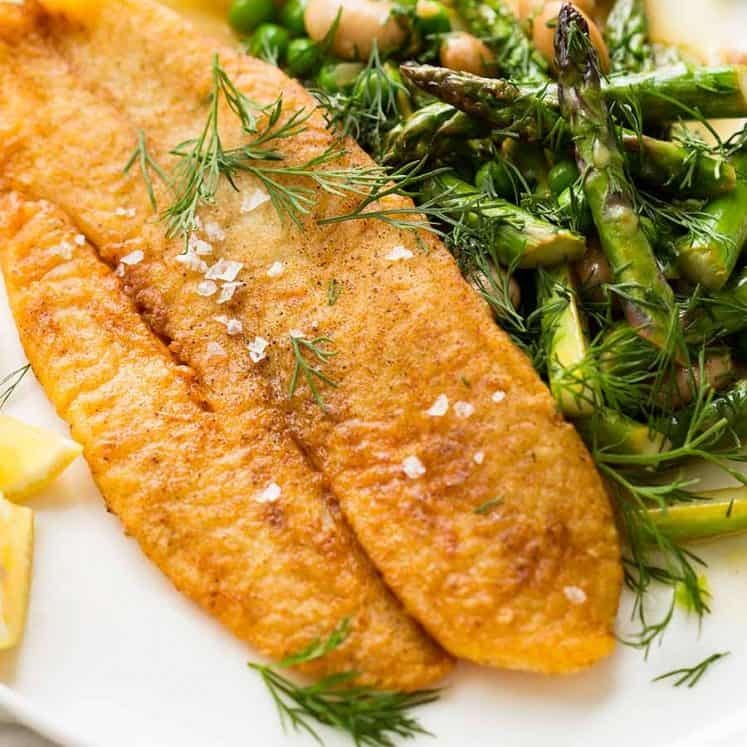 Cook fish for 2 minutes on each side, or until charred and cooked. 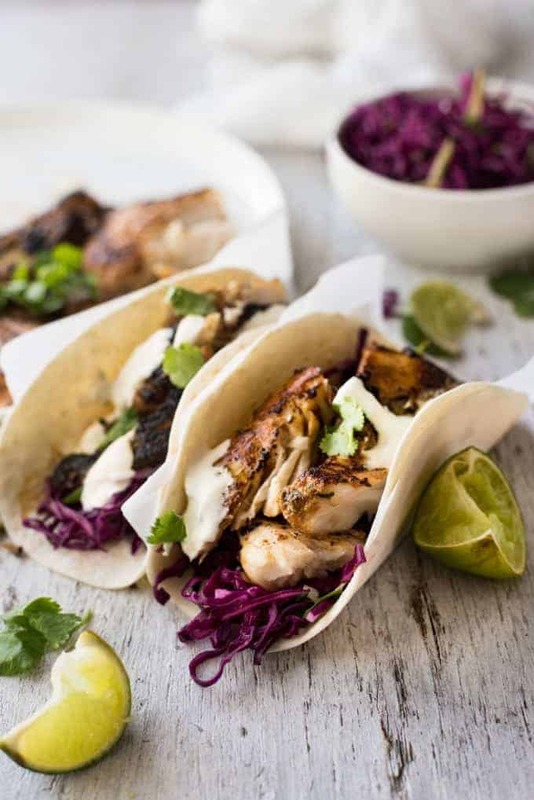 To assemble tacos, top with cabbage then fish, a dollop of sour cream and a squeeze of lime juice. Fold tortilla over and enjoy! 1. While Chipotle powder is sold in most supermarkets in the US, it can be annoyingly difficult to find in Australia. 🙂 It is not sold in the major supermarkets (yet) but you can find it in fruit & veg stores, delis and gourmet/speciality stores (e.g. Herbie, Thomas Dux). It does not cost much more than ordinary spices. It can be ordered online from Firework Foods (Aus only). If you can't track it down, I think the best substitute is ½ tbsp each SMOKED paprika, cumin and cayenne pepper. 2. NuNutrition for 3 tacos (tortilla + fish + pickled cabbage). Absolutely yummy. It’s the only way I can get my daughter to eat fish. Thank you! What would be an ideal side dish for these tacos? Hi Coco, https://www.recipetineats.com/grilled-mexican-corn-with-chipotle-adobo-sauce-mexicano-restaurant-copycat/ this is a great side! Nagi, you are definitely psychic! I wasn’t even actively searching a new recipe for fish tacos – yours found me! And guess what? TODAY is “taco Tuesday” – and I was planning to head across the way to the shopping center with Rubio’s since they do cheap tacos on Tuesdays BUT I can feast in my own home instead. 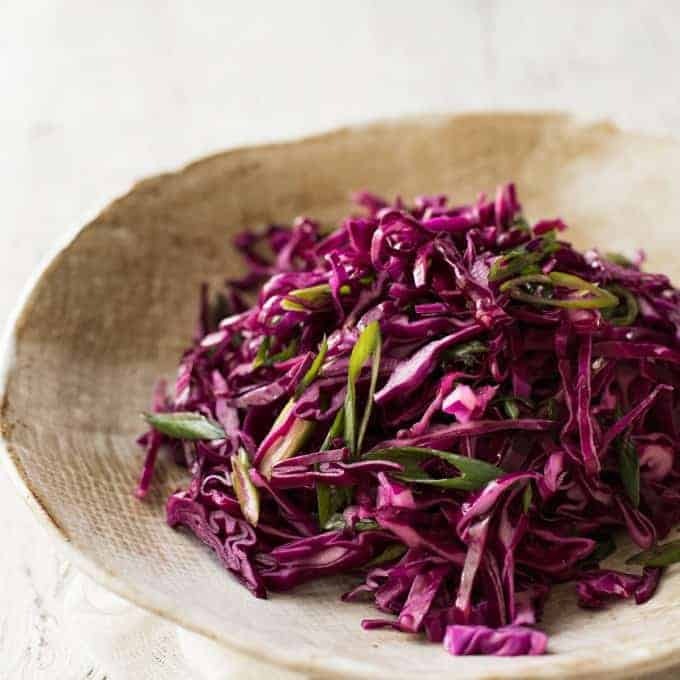 LOVE the idea of pickled red cabbage for flavor and crunch. I have a couple of just-right ripe avocados and some marinated carne asada so I will lay out a banquet of Mexican food tonight! Wish you were here so I could share with you (bring Dozer and Katie will get the door!) I don’t know if I can hold off for dinner time, so I just might have to do what old people do and have dinner at 3:00 PM! These fish tacos are perfection! As a born and raised San Diegan, I can honestly say Nagi’s Mexican recipes are spot on! The only thing I did differently was to add some lime juice and spices to the sour cream. I’ve made them twice in a week and even served them to guests who couldn’t get enough..LOVE THESE!! Superb! This is the Best fish tacos I have ever tasted. Your spices and condiments are always perfect. NAGI … JUST CAME ACROSS YOUR SITE & HAVE CHECKED OUT A COUPLE OF RECIPES (GREEK CHICKEN & LEMON RICE … AND THIS FISH TACO ONE). BOTH SOUND SO FLAVOURFUL & LOOK SO TEMPTING. A COMMENT ABOUT YOUR STYLE …. YOU ARE ONE OF THE ONLY RECIPE WRITERS TO INCLUDE PERTINENT INFO LIKE THE ACTUAL SIZE OF YOUR PAN OR YOUR TORTILLA !!! SIMPLE BUT SO HELPFUL. ALSO YOUR DESCRIPTIONS ARE DETAILED … AND YOUR NOTES ARE THE BEST. SO HAPPY I FOUND YOU ! I agree. Nagi adds those extra all important details in her recipes which make all the difference. I love how authentic your recipes are. And these fish tacos are so delicious. I had some fish taco’s at a trendy restaurant last week in Nashville TN that was know for their “great” fish tacos. This recipe beat them hands down. I also used 8″ flour tortillas for a larger sized taco. I did a variation as I had some breaded cod fillets. I deep fried them 80% done and then split them lengthwise and rolled them through the marinade. I finished them off in a convection toaster oven for a crispy crust with the spicy tang of the marinade. I also used fresh Serrano pepper instead of canned Jalapeño (a little more kick). The Pickled Cabbage was the what brought it all together. Perfect balance. I’ve made a couple of your recipes now and not disappointed… making pad kee mao with tofu and veggies tomorrow. SO excited! thanks! Hi Nagi, I love the way you photograph your recipe, but also knowing that you’ve mentioned yourself that you’re height challenged I’m just visualizing you standing on a chair to get the right angle. LOL. Definitely going to try this one, maybe over the weekend. Apple cider will be perfect! 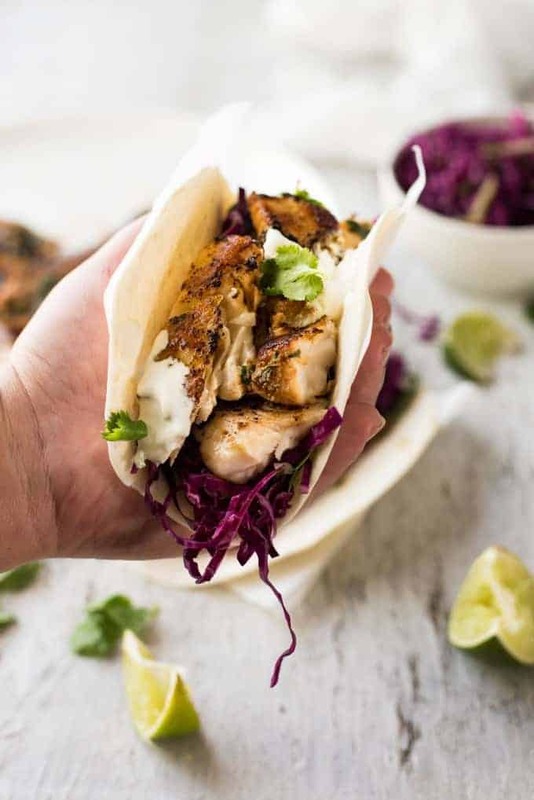 HI Nagi I’ve been wanting another fish taco recipe ( I have a fish taco obsession) and I’m so fixin to make these this week. One question though. When you say canned jalapenos do you mean pickled jalapenos like for nachos? Hi Robert! Yup the stuff that comes in jars or cans in liquid 🙂 Hope you enjoy this! Will the jalapenos in the marinade make the fish too spicy for toddlers? I’m not sure how much of a marinade transfers to meats… absolute beginner here. Nice recipe! We all enjoyed it! Nagi, I just came upon your blog and printed off several recipes—can’t wait to try! Dozer is gorgeous…I am passionate about Goldens—I’ve had 5 rescues over the years. Thanks for sharing such delicious food items! 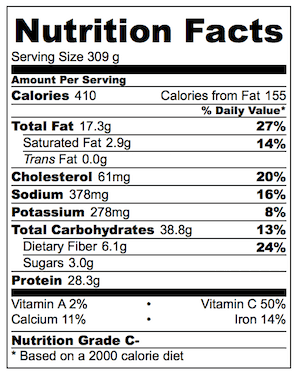 Penzeys.com sells chipotle powder. I get all my spices from them, they are the best. I will try these soon. Unlike so many commenting here, I never had a fish taco I didn’t like & I’ve tried a lot. I have a bunch of salmon in the freezer. Do you think the flavors would work with salmon? Thanks! Definitely! 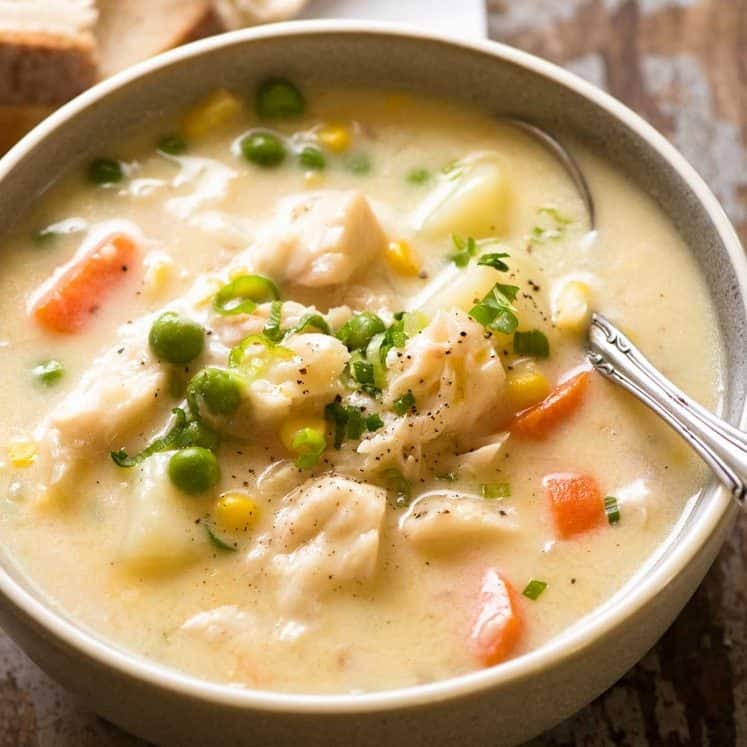 I’ve made this with salmon and it is phenomenal! Thanks Nagi! This is on my “must try” list! Fantastic fish tacos Nagi! Love, love, love! I made it last week for my family and we all loved it. Thanks, I make home made wraps for my husband and I to take to work.Looking for inspiration and this looks yum yum. 🙂 ill let you know how the Philippine version goes. I’m English but Ill be using Asian ingredients. Can I make your pickled cabbage in advance and keep refrigerated in a mason jar? These were fantastic. I’ve loved fish tacos since the first time I had them in Anchorage, Alaska, where they made them with halibut. I’ve been trying to find fish tacos that were as good as those Alaska tacos, and nothing has held a candle until now. I made these using halibut (as apparently that’s the best fish for fish tacos) and I added a chipotle-mayo sauce at the end. I also used chipotle adobe sauce in the marinade instead of chipotle spice (because I didn’t read there recipe carefully before shopping). In any case, they came out great! Thanks for the recipe. I’ll definitely make these again. So glad Leah! Thank you for trying my recipe and for coming back to let me know you enjoyed it! N x PS LOVE the addition of chipotle mayo – YUM!